In late March 2014, Microsoft released long-awaited versions of Office for Apple’s iOS platform. These apps require iOS 7 or later to work. Quality and Effectiveness: The free versions of the app provide “viewing” rights to existing Word, Excel, and PowerPoint documents. A separate Office 365 subscription is required to create new documents from scratch or with the ready-made stylish templates included with each app. A subscription is also needed to edit existing documents using tools from the program’s ribbon toolbar. Ease of Use: You can work with Office for iPad Word, Excel, or PowerPoint documents by either opening an existing file or creating a new one. Since all your work is saved to OneDrive, you can begin exactly where you left off. After activation, it’s easy to edit files that previously were available only for viewing. Microsoft designed the touch-sensitive Office for iPad apps to take advantage of features built into Apple’s iOS and to resemble the interface of existing Office desktop applications. Creative Use of Technology: While each Office for iPad app is a slimmed-down version of its corresponding Office desktop application, all apps offer a variety of tools and rich formatting options that won’t disappoint. For example, Word and PowerPoint for iPad let you format text for strikethrough, subscript, superscript, bold, italic, and underline. You can insert tables, pictures, shapes, and text boxes, choose a different text color, and align text in multiple ways. 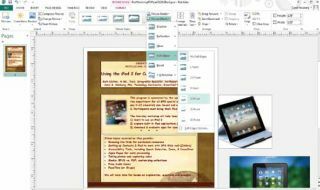 Transitions and animations created in other versions of PowerPoint will also display on PowerPoint for the iPad. Suitability for Use in a School Environment: Office for iPad apps facilitate collaboration, allowing several people to work together simultaneously on a document shared via OneDrive. Authors can decide if team members can edit or only view a document. You can share the document as a link, allowing the recipient to edit or only view the document saved in a shared space on OneDrive. With the release of version 1.01 in late April, Microsoft added support for AirPrint. Users can now select “Print” from the File menu and print to any AirPrint compatible printer. OVERALL RATING: Terrific features notwithstanding, Office for iPad apps do have a few limitations. For example, AutoSaving requires Internet access. Additionally, the impact of AutoSaving on bandwidth is unclear. Even with these limitations, there is much to appreciate in the first release of Word, Excel, and PowerPoint for iOS 7.